1. Natural Presentation – Just like in fly fishing, there’s an art to drifting an artificial jig along with the current. You’ve probably heard me say a hundred times that rockfish can’t swim backwards, so they must face the current. When fish are plentiful, a natural presentation isn’t so important, but when they’re finicky, or when you’re looking to catch bigger fish out of the schools, it’s critical that the lure moves naturally downstream toward the fish. If it’s too slow or too fast, the bigger fish won’t hit it. Little ones might bite, but you won’t consistently catch trophies. Since we can’t mend line like in fly fishing, better light tackle anglers us a sweeping technique in high current situations. It takes a lot of practice, and the art comes in casting across the current and letting the jig drift naturally away from the boat while only occasionally touching the bottom. I only know a handful of fishermen who can do this successfully, and they are routinely rewarded with huge stripers. Some places where the art of sweeping is important include the rockpiles of the Bay Bridge, high-current narrows like those around Kent Island, over the tubes and around the pilings at the Chesapeake Bay Bridge Tunnel, and at the warm water discharges of the mid-Bay. A sweep is just one example of a natural lure presentation. I’ll discuss others in a later entry. 2. 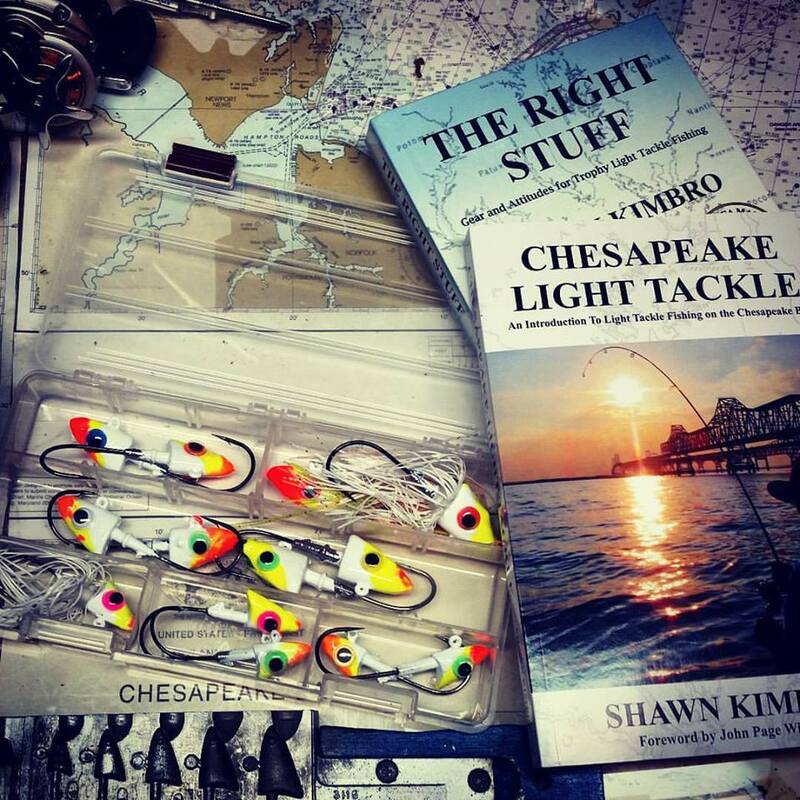 Lure Design – We’ve come a long way since I first started this blog and introduced candy corn jig heads and hot-rodded baits to light tackle fishing on the Chesapeake Bay. About ten years ago, my partners and I began attaching spinner-blade skirts to our jig heads in order to widen the profile of the lure. This was inspired by a lure designed by George Lenard of Specialized Baits called The Bug. Now, almost every local lure maker is producing jig heads and soft plastic baits with contrasting colors and skirts. Some of them are artfully decorated and absolutely beautiful. One of my favorite things about winter is the evenings I spend in my shop pouring lead and creating lures. If you haven’t tried making your own jigs, you’re missing a lot of the fun in light tackle fishing. It isn’t hard to learn. Once you get comfortable with the basic skills, you can begin customizing your lures to the bait patterns you see when you’re fishing. Eventually, you’ll start recognizing colors that work best in specific combinations and you can continue to refine your art to improve your catching. It only takes a split second for a fish to inspect, then take or reject your lure. Why not show them something they can’t resist? 3. Tuning in to Patterns – Someone once defined art as patterns informed by sensibility. The Chesapeake estuary is a fascinating tapestry of underwater plants, aquatic organisms, insects, and animals. To really understand the fish we try to catch, we have to tune in to the life cycles around them. Simply put, the more we learn about the environment we fish in, the better equipped we are to fish it. We could study for a lifetime and never learn all there is to know about the Bay, but every tiny bit of knowledge we gain can make a difference in how we adjust our techniques and ultimately, lead us to catch more fish. 4. Fish Photos – Every picture that I’ve published in my books or on this website was taken with a cell phone camera. Occasionally, you may see shots taken by more professional photographers when they join me on Thunder Road, but I don’t own an expensive camera and all my shots are spur of the moment with my phone. I admire the work of professional photographers but I can’t hope to compete with their skill and artistry. I have to do the best I can with the tools I have available. 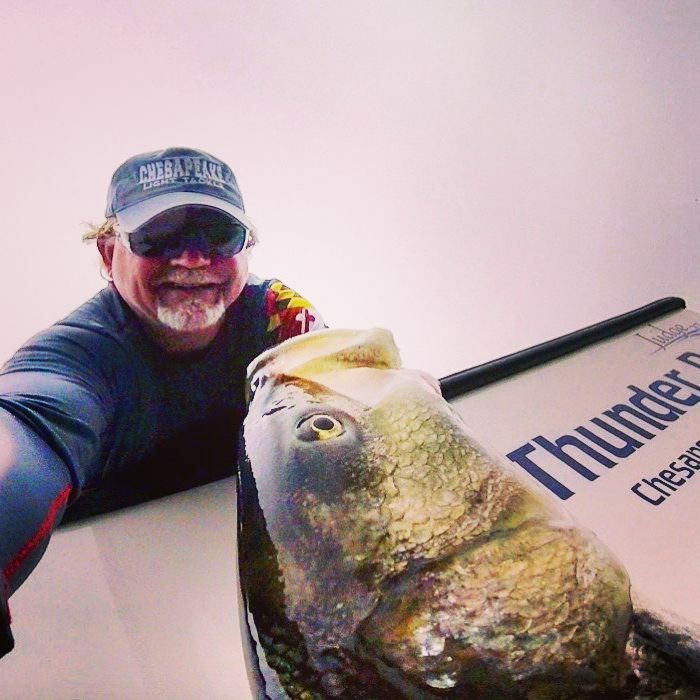 Fishermen love to see pictures of fish, but most of us grow tired of the same old clutch-and-click photos. It’s fun to experiment with creative camera angles, underwater shots, panoramic compositions, video stills, and close ups. Sometimes my ideas don’t work, but once in a while, they do. It doesn’t cost anything to click that camera button, so why not experiment with your shots to see what you can come up with? I’ve been paid for at least a dozen of my cell phone pictures and many have been published in newspapers and magazines. One even made a magazine cover. There’s a lot you can do with your cell phone camera if you’ll apply a little creativity. 5. Fishing Reports – Is there an art to fishing reports? You bet there is. I don’t post too many narratives on message boards anymore because I find social media to be a lot quicker and easier. Still, there’s something to be said for a comprehensive and well-composed fishing report. The essentials of a good report are patterns, lures, depths, time of day, current, and weather conditions. Anyone can write about that, so why not throw in some personal observations and tips that you learned along the way? There are artful ways to tell other anglers exactly where and how you are fishing without broadcasting your GPS coordinates to the world. Video reports are great too, but not too many viewers will take the time to watch fourteen minutes of you reeling in a fish. Keep your videos short, sweet, and to the point, while including all the report essentials. We don’t always need details like what you had for lunch or what shade of blue shirt your buddy was wearing, and for god’s sake don’t burn your fishing spots! Sharing some of the details about the beauty you found around you, however, can add a lot to your reports. 6. Release Techniques – Yes, there’s absolutely an art to releasing your fish. We’ve made a lot of progress, but I still see anglers dropping nets on twenty-inch rockfish and holding bigger fish by the gills. For Pete’s sake, learn how to handle your fish! If you’re afraid you’ll get bit by a rockfish, you should probably take up golf. There are exceptions for inexperienced anglers, boats with high gunnels, and for catch-and-keep anglers who are just fishing for dinner and going home, but a big part of light tackle fishing is taking responsibility for the fish we catch and release. Most of us will catch our limit in the first 20 or 30 minutes of fishing, especially in seasons like this one when fish are plentiful. The primary attraction of light tackle fishing is that we catch a lot of fish. Artful light tackle anglers use the best known practices when handling their fish. Some of these practices include wetting your hands before touching a fish, keeping the fish in the water as much as possible, supporting the weight of bigger fish by holding them underneath their bodies, handling smaller fish by using one hand in the mouth so you don’t remove too much slime, learning how to fight and land fish quickly, reviving fish after a longer fight, and, while I’m not suggesting you take up golf, just stay off the water during those hot mid-summer afternoons. 7. 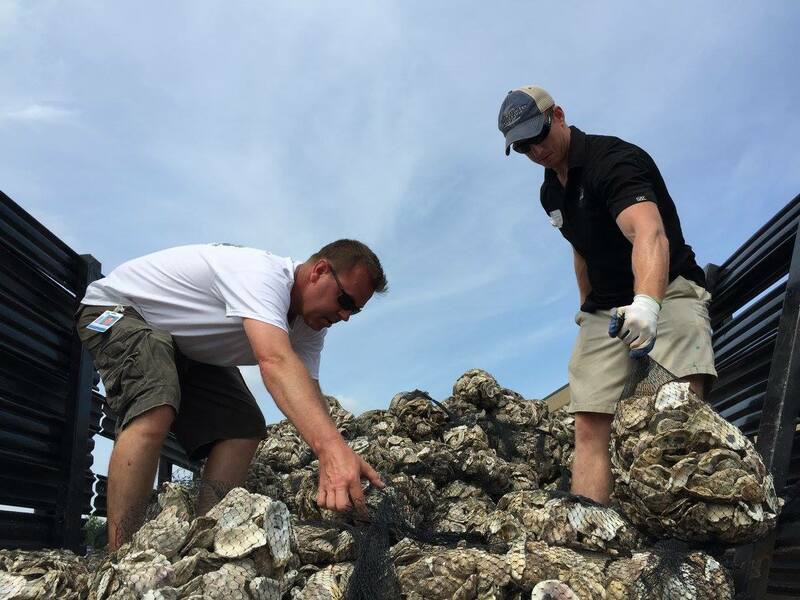 Joining Conservation Efforts – As light tackle anglers, we get a lot of enjoyment from the natural resources of the Chesapeake region. One of the primary reasons why I like to promote light tackle fishing is that I believe the overwhelming majority of light tackle anglers will become conservationists. It just comes with the territory. Light tackle artists who are tuned in to the strikes they feel on their lures are almost always tuned in to the value of the resource they enjoy. They want to protect it for their kids and grandkids. 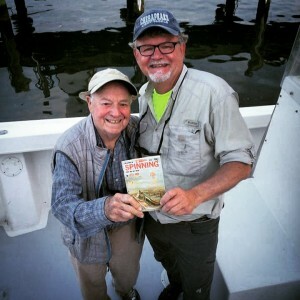 Almost every angler I know considers him or herself a conservationist, but artful conservationists put their money or their actions where their mouths are. Light tackle artists understand that the beautiful clear waters we are fishing now, and the abundance of fish we are presently enjoying, are just one snapshot in time in the much bigger picture. When things are good, there’s no shame in patting ourselves on the back for our conservation work that helped make it that way, but they may not stay that way long if we let down our guard. Don’t be lulled into apathy by a single season of good fishing. It’s no secret that there are more light tackle anglers fishing the Bay now than ever before. I hope I’ve been at least a little bit instrumental in steering anglers toward the fun of light tackle fishing. In years past, there were only a handful of light tackle anglers who could consistently catch fish. My fishing partners and I felt like we owned the Bay, or at least part of it when it came to finding and catching fish on light tackle. Those days are over. 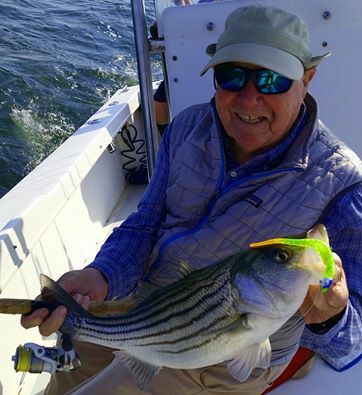 Now, there are dozens – maybe even hundreds – of expert light tackle anglers fishing the Chesapeake, including a lot of younger fishermen and women who are consistently successful. Even though I have a lot more competition on the water, I intend to keep giving fishing tips and advice. There’s more to light tackle fishing than floating down the middle of the fleet and dropping a jig on a fish’s head. In fishing, as in life, we find art when we step away from the well-known toward the evasive and the concealed. The best anglers work constantly to improve their game. 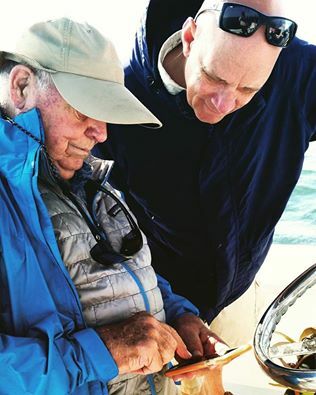 One of the lessons I’ve learned from Lefty Kreh, and others like him who have enjoyed a lifetime of accomplishment, is that true success comes in sharing knowledge. Success isn’t measured by how high we climb, but by how many we take with us. Great read Shawn! Very well said and these reports and articles somehow help keep me in the game at a time when my health conditions won’t let me fish, often. Thanks! When I am able to go I want to prepare in a way that will make that trip as productive as possible! These reports help with that also.